This is one of, if not the most powerful tombstone radio I have ever offered for sale. This radio is a beast in both size and performance. The radio is a massive eleven-tube super-het chassis designed for five band reception with a very good working shadowgraph. Today three of the bands are vacant, but on AM and shortwave, this radios is an extreme performer. Note the ornate radio dial with many stations backlit by a super bright dual pilot light configuration. If you are a shortwave listener, you will never find a finer performer of this era. The condition is 100 percent original with a nice factory finish, original (8-inch) speaker cloth and knobs. Les has done his most professional repairs and the radio performs as new. Note this radio is a very complex circuit and he spent extra time to repair it to maximum performance. 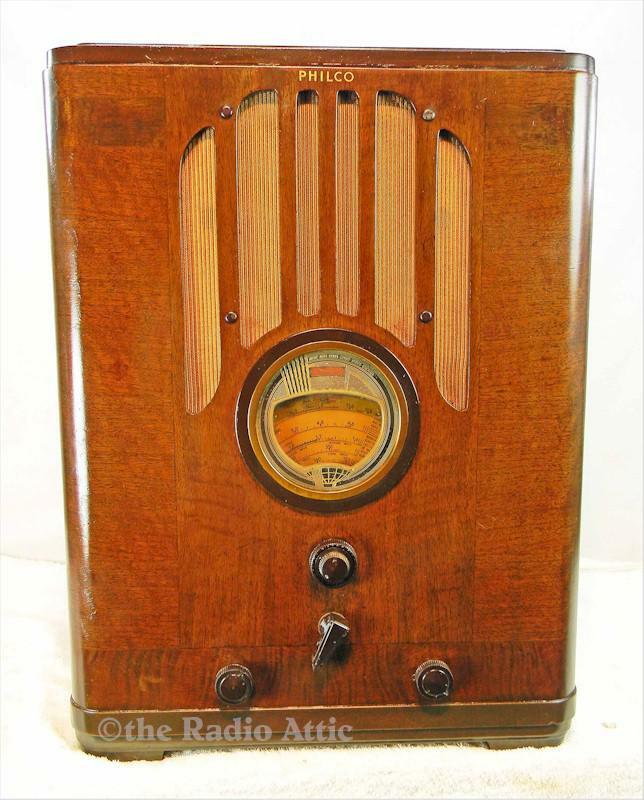 The radio has a mini-jack for your connection of any modern device allowing an unlimited choice of content. Bluetooth is available for $25.00 additional. With the sheer size and weight of this monster shipping is going to be high. 20-1/4"H x 16'w x 15-1/4"D.
You are visitor number 2,183 to this page.